Home > Comet Clutches and Parts > Comet 205838A. Duster 94C 30MM Clutch Puller Kit > Comet 206094A. Comet Industries 94C Duster Drive Clutch. TAPERED BORE (30mm). > Comet 215097A Spring Kit - Silver for Comet 94C (SMALL) > Comet 205819A. Green Comet Duster 94C clutch spring. 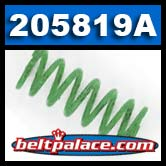 ”Green” Spring fits Comet 94C Models: 206094A, 206096A, 209924A, 211493A, 211879A. Tension at 2-5/16” = 68, Tension at 1-1/4” = 150. Replaces Salsbury-Comet OEM 204529/C. Green Spring. 205819-A Comet Industries 94C Duster Series Centrifugal Clutch spring. 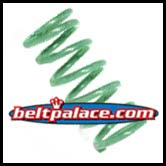 Comet 94C Series Drive Spring: Green tension spring. Replaces standard (stock) Orange 94C Duster spring. Use ONLY with Comet Industries 94C “Duster” torque converters.